Good luck makes a great gift for anyone and any occasion and we make it in all kinds of colors! This one is shiny, bright blue and sure to bring good luck to all who pass by. 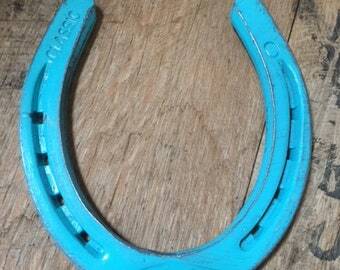 Horseshoes are made from cast iron, hand painted and then sealed for extra protection. 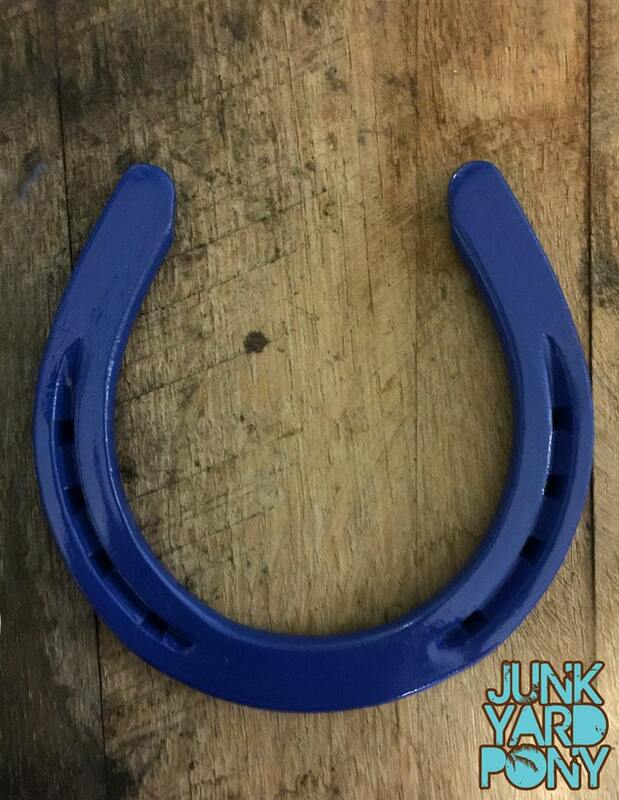 Each one of our horseshoes come with a complimentary gift tag and small ribbon of you color choice. We can write something on the card for you and attach to the horseshoe (as pictured) or we can send to you blank for your own personal touch. Please send me a convo if you would like a personal message written on gift tag. Size and shape of shoe may vary between 4.5 - 5" Wide/Tall and 1/4" thick. If you would like an extra small or extra large shoe or if you have any special requests, please convo me and I'll do my best to accommodate. *If no color is selected, you will receive the color of the shoe as listed and matching ribbon. ********FOLLOW US, LIKE US, ADD US and we'll keep you laughing plus you might score on some cool news before anyone else. ShopJunkyardPony accepts Etsy Direct Checkout using your debit or credit card or PayPal. If you need to make alternate payment arrangements, please contact me through Etsy Convo methods. I put lots of love into everything I make and want you to love it as much as I do! I do my best to accurately describe my items but if you need additional info, need to see more photos or have any questions at all, please feel free to send me a Convo. Happy Customers are my number one priority. If for any reason you aren't happy, please give me the chance to resolve any concerns. You can Convo me or email me directly at shopjunkyardpony(at)gmail.com within 10 days of receiving your order. Items are shipped within 3-5 business days (excluding holidays) of confirmed payment to the address provided on ETSY. Please note that all fees associated with receiving items into your country, (customs fees, import fees, duties, taxes, tariffs etc.) are the responsibility of the buyer. Shipping charges do not include any of these fees. If you have any questions regarding customs fees, tariffs, taxes, etc, please check with your local postal service or customs office for more information prior to purchasing. Shipments outside of the USA may take additional time for delivery. If you have any special requests, please contact me in advance through Etsy Convos. Wholesale orders welcome! Please Convo me for information on selling Junkyard Pony Jewelry in your store.